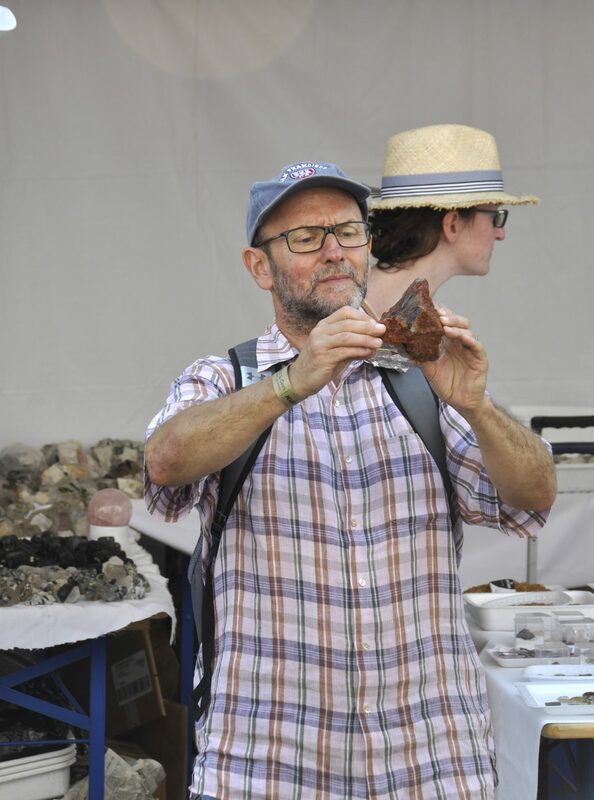 We recently visited the rock and gem fair at Saint Marie aux Mines in Alsace, which, for those into their mineral and fossil specimens was an absolute treasure trove. Saint Marie is an old silver mining town with a rather down at heel, post-industrial feel to it, with many empty and abandoned buildings. This said, it comes to life with the huge influx of exhibitors from all over the world with their camper-vans, tents and trolleys, selling anything from tumbled stones to the ultimate in museum quality mineral specimens and fossils at $100,000 + . We thoroughly enjoyed our time there, despite the 35 degree heat and beating sun, going home with a small hoard of new goodies including a nice 22ct Brazilian Paraiba tourmaline cabochon and Brazilian emerald crystal, plus some nice rough topped tourmaline and mixed beryl flat shapes. Given the money and a van we could have gone home with a wealth of disparate goodies. This part of Alsace is a very beautify region of mountains and lovely valleys with picturesque villages nestling in them, picture postcard perfect. The area also has its own distinctive German influenced cuisine which is very different from the rest of France, but very good and of course excellent Alsace wines. You are also only a short drive from wonderful, beautifully preserved medieval towns such as Ribeauville and Colmar which are well worth visiting.